The bonnet with braids is a quick and easy way to create a costume for characters such as Raggedy Ann. 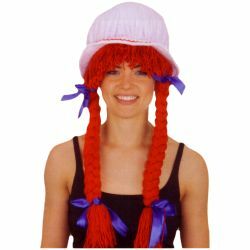 It features a white mob cap with attached red yarn wig that is tied into pigtails using a blue ribbon. The bonnet with braids is colored as pictured and is one size fits most using adjustable elastic strap inside of the mob cap.